Most AVS products differentiate themselves with unique styling features, but they all speak the same design language to ensure customers can easily interact with them. When you build your first Alexa-enabled device, you can follow AVS' UX Guidelines to help your customers understand what's happening. Most Alexa-enabled products use LEDs to communicate the "Attention State" of the device. As you can see from the above table, attention state guidelines include Blue LEDs when Alexa recognizes the Wake Word (listening state), or Red LEDs when the user has turned off the microphones (privacy mode). In this workshop, we’ll use the AVS Device SDK to implement visual indicators of device state into your product. If you've already got some LEDs and resistors laying around, you can use those. 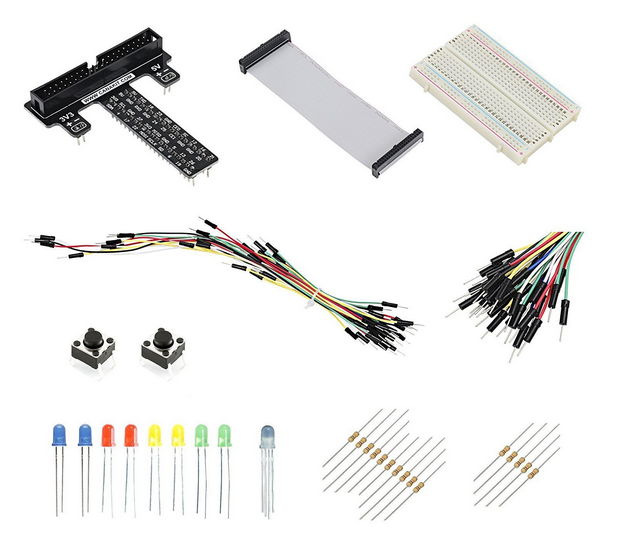 For this tutorial, we're using the GPIO Breakout Bundle from CanaKit, available from our wishlist here. Plug your ribbon cable into the black breakout board and install it in the breadboard as shown in the below picture. Using two jumper wires, attach them to the pins labeled 17 and 18 on the black breakout PCB. 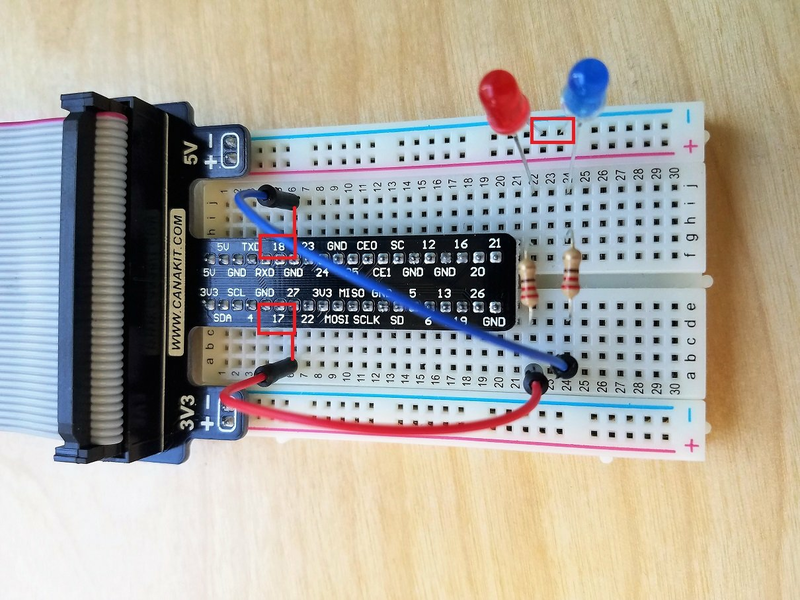 You can do this by plugging into the same row as them on the breadboard. Install two resistors from your kit with color bands red/red/black/gold as shown. This corresponds to 220 ohms which is enough to push some current through the LEDs without exploding them. Make sure the resistors straddle the middle of the breadboard. Grab a Red LED and a Blue LED from your kit. Notice how one of the legs is shorter than the other? Put the short leg in the furthest right row on your breadboard - this should correspond to the negative terminal (GND) on the breakout board, marked as negative on both the black PCB and shown as a blue row on the breadboard. The long leg of the LED should connect through a resistor to your jumper wires - wire pin 17 to your Red LED's resistor, and pin 18 to your Blue LED's resistor. Check your connections against the picture carefully before plugging the other end of the ribbon cable into the Raspberry Pi's header. Ensure your ribbon cable is aligned squarely on the Pi's header without any pins offset or sticking out. We need to add the WiringPi library to the SampleApp project so that we can control output pins on our Raspberry Pi. Open the file “main.cpp” and add the include header statement at the top of the file as shown. 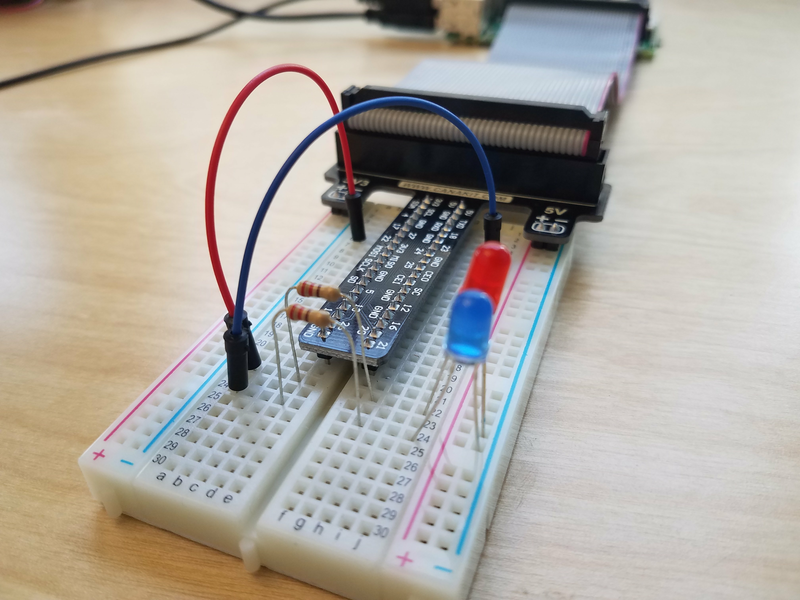 If you've already done the Indicate Device State with Sounds tutorial, these next steps will be familiar to you - we're going to find the hooks for Privacy Mode and Listening state, then add the output commands to them to drive our LEDs. Scroll down a bit to the UIManager::microphoneOn() function and add digitalWrite (0, LOW); to turn the Red LED back off when you exit Privacy Mode. One more thing! We need to initialize that LED so it's not in an indeterminate state on startup. 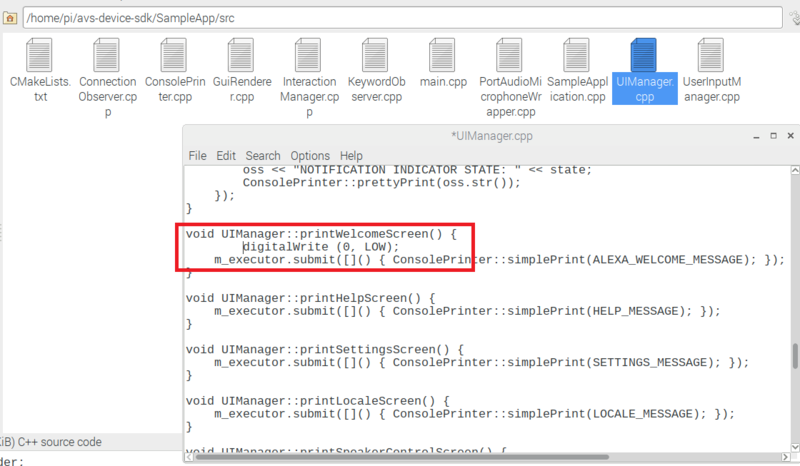 Scroll up to the UIManager::printWelcomeScreen() function and add digitalWrite (0, LOW); inside the brackets as shown. Now let's add the Blue LED for Alexa's Listening state. 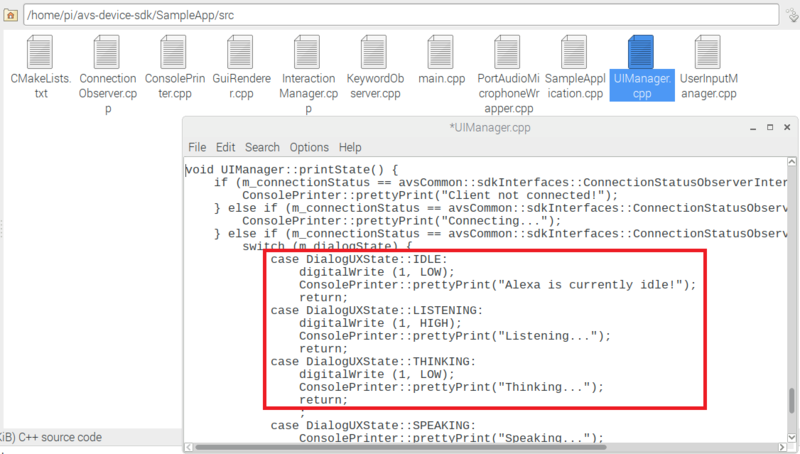 Near the bottom of the file in the printState() function, where it says case DialogUXState::LISTENING:, add digitalWrite (1, HIGH); to drive the Pi's GPIO pin to 3.3V and turn on our LED. Of course, we've got to switch the LED off when Alexa isn't listening. Let's do this by adding a digitalWrite (1, LOW); to states IDLE and THINKING. When you're finished, your states should include the code as shown below. Don't forget to save before closing. For the final step, you'll need to make a change to the CMake file in order for the project to use the WiringPi library when you rebuild the Sample App. 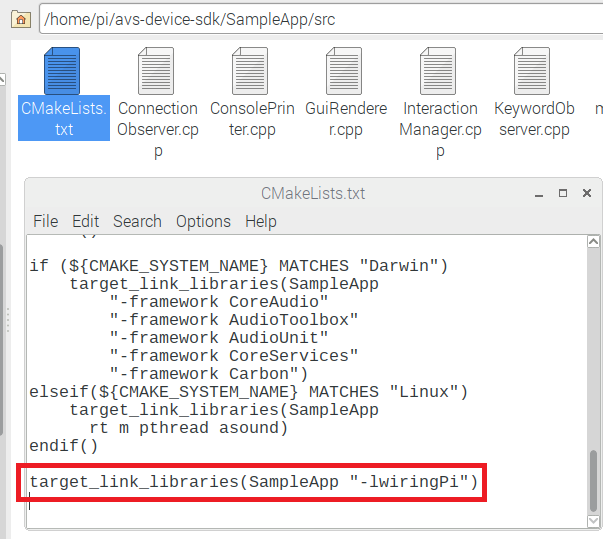 Open the file “CMakeLists.txt” from the same home/pi/avs-device-sdk/SampleApp/src folder and add target_link_libraries(SampleApp "-lwiringPi") at the bottom of the file as shown. You'll also need to re-input your credentials after adding wiringPi to the CMake file. You can do this by re-doing the initial install step. This should only take 30 seconds, and won't require you to re-authenticate. Now, say "Alexa" - you should see the Blue LED light up to indicate when your device is in the "Listening" state. Toggle your device in and out of Privacy Mode by typing "m" and hitting "return" in your Sample App - your Red LED should indicate the state. The AVS Device SDK allows you to easily implement the Attention State system in hardware. Stay tuned for more advanced tutorials where we'll follow AVS's UX Guidelines to implement animations for THINKING and SPEAKING states, as well as indicators for Notifications, Error States, and more. Be the first to know when new tutorials are released by signing up for our Voice Mail Newsletter for professional AVS developers on the Alexa Voice Service Developer Portal. If you make something awesome - please share it! Share a link via the feedback button.